Hey Ezuri player, yeah you. You look like you’re a little stalled out. Need some help? Ok, great; I’ve got a little offering you then. What, you don’t trust me? Ok then let me explain what this is all about. It’s simple, really; I’m here to help you. And maybe, if we’re ever sitting down together for a game, you’ll help me in return. 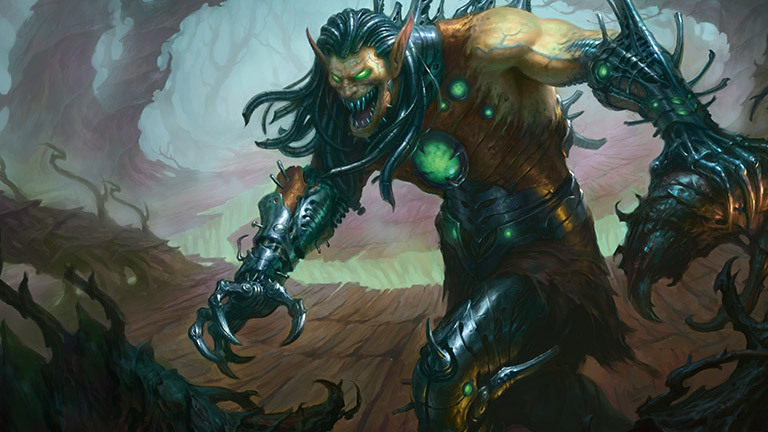 In this series we’ll be turning a critical eye to deck’s statistics here on EDHREC. Each offering will be comprised of two parts: the first segment will look at three cards listed as top or signature cards that I think should garner less attention than they are receiving; in the second part I’ll offer suggestions for three cards that are being underplayed, or overlooked entirely. Finally we’ll tie it all back to a deck list to give some context to the new additions. For this first installment, we’re going to look at Ezuri, Claw of Progress. Ezuri has grown in popularity over the last week, rising to the 9th–most-submitted deck; a trend which I honestly am not surprised by. Ezuri has a lot to like; he’s a powerful commander that can still fly under the radar of most casual tables. He lacks the groan-factor associated with the Edric, “I’m going to take the next 6 turns now but who knows, I could whiff off these 9 cards I’m drawing so you should keep playing” decks. He also has the benefit of being a primarily creature-based deck, which gives him plausible deniability that the Kruphix, “I swear I’m not going to do anything with this 256 mana I have” player lacks. So how do we start analyzing a popular commander like this? The important question you always have to ask yourself is, “why is this card in the deck?” it sounds so simple, but actually answering that question is where most people get it wrong. With popular commanders, popular cards get pushed to the top spots in the list, which in turn means more people are more likely to include them in their lists and so on and so forth without ever actually answering this basic question. The logic is, “well if 44% of people play this card, and it’s 40% more common in this deck than other decks, I should clearly be playing it”, which is obviously flawed. If you haven’t figured it out yet (or the statistics have changed) the first card I’m talking about is Blighted Agent This guy isn’t in the majority of Ezuri decks, but he’s drastically overplayed compared to other Simic commanders. But why? He doesn’t actually do anything for the deck. Sure he triggers Ezuri and carries counters, but so does Grizzly Bears. Sure he can kill people if you have enough experience counters and he survives long enough to hit them, but that’s a lot of ifs. The power of this deck is in playing all the value creatures, like Mulldrifter and Solemn Simulacrum, and still have the scaling to work its way through the late game. Blighted Agent not only fails to provide you with the same value as the other creatures in the deck, he also has the added downside of drawing unnecessary hate down on you from the rest of the table without being quick enough to kill people before that hate has a chance to manifest. Speaking of slow creatures, why are so many (64% at the time of writing) of you playing Trygon Predator? Sure it has the potential to blow up an artifact or enchantment, and it does trigger Ezuri, but as I’ve argued above, that’s not enough reason to play it in this deck. The card is incredibly slow; so slow that it often won’t deal with a threat before that threat has a chance to get out of hand. Later, when I make my offering to the deck, I’ll discuss a card that does do what we are looking to Trygon Predator to do. For now, let’s just say that I don’t like playing 3 mana do-nothings just to trigger Ezuri. This card is a perfect example of an effect that will come up a lot in this series which I will refer to as “precon syndrome”. This card was included in the original pre-constructed decks as a way to show new players that there are older cards out there that can provide benefits while being good counter carriers. That’s great, but as more players enter their precon decklists into the engine looking for suggestions a bias begins to build up towards the cards that are already part of that list. This doesn’t mean the card will belong in the final version of your deck. In fact, I’d argue that it’s a reason to be even more critical of its inclusion. Also in the “precon syndrome” category is Prime Speaker Zegana. This card doesn’t even trigger Ezuri! It was put in the precons as an alternate general that interacts with counters because for whatever reason wizards didn’t want to put Vorel in. Their motives aside, I think this card is one of the least impactful options the deck can play. At 6 mana it is possible to draw tons of cards if you have a beefy creature in play, but I just don’t foresee this deck needing that in situations where you have all the parts together. If you’ve already got a huge creature in play, you’re doing just fine. The deck also should be running Coastal Piracy effects since you’re already trying to get there in combat. Drawing a couple cards here and there off combat damage also puts much less of a target on your back which is good for this deck as we’re aiming for the long game. Now that we’ve made a little space in the deck I’d like to make you an offering. The first card I’d like to put forward is, what I feel is a no-brainer: Reclamation Sage. It’s so simple, but looking at the numbers, only 47% of people are playing it. Why isn’t every single deck playing this card? It triggers Ezuri. It’s cheap, both mana and dollar-wise. It deals with all of the problem artifacts and enchantments that would normally throw a wrench in our plans. What more do I need really need to say? This is the card that should replace Trygon Predator. They serve very similar functions, but while Trygon Predator needs to wait a turn before it can attack, giving our opponents a chance to react, this comes down and immediately does work. The fact that it lacks the evasion of Predator is more than made up for by the fact that it always hits its mark. Additionally making this an enters the battlefield ability pairs more nicely with the other creatures we already want to play in the deck, meaning that we can add more cards that take advantage of these abilities. And we don’t have to look farther than my second card: Crystal Shard. This card can fill a lot of roles in this deck, and yet it doesn’t even show up on the site, which means less than 10% of people are playing it. Giving this deck a way to reset all the enters the battlefield creatures that we’re already playing is huge. Like Reclamation Sage, or how about Mulldrifter? Evoking it, then responding to the evoke trigger by bouncing it with Shard is a great way to build momentum without actually sacrificing resources. If that wasn’t enough reason to include shard, it also allows you to save critical creatures from wrath effects; something which we can very much expect to see given our aggressive nature. Speaking of protection, the final card in this offering is all about that: Sylvan Safekeeper. This is another card that doesn’t come up when you look at Ezuri, but I think it’s a very important effect to have. You see, for all his outward smiling, Ezuri is a pretty fragile elf, and our opponents are likely to take advantage of that. Some people (24%) have recognized this and are already running Asceticism, which a fantastic card that can protect our whole team from multiple angles. It is also a fairly expensive card, and while I’m not going to pull punches with budget, I like the idea of getting a similar effect that has the added upsides of being less costly and also triggering Ezuri. The downside of losing a land to protect our main engine is very low, especially when you consider the number of times this will actually deter people from even making us pull that trigger, for fear of wasting their removal. Since the average converted mana cost of cards in the deck will be generally low, and being in green means we have access to all the best ramp to make up for a couple of lost lands means that the downside is very easily mitigated. I’ve included many of the big hitters listed here on EDHREC. I’ve also put a few personal touches in there, something I think every deck should have. The enters the battlefield creatures take front stage, alongside a few additional ways to reuse them. I’d like to hear your thoughts; this series is new, and will have a lot of room for reader interaction whether it be through suggesting decks, or discussing the source of particular statistic. So please, leave your comments in below, or reach out to me via email. Sam Alpert is an EDH filthy casual who's enjoyed magic for the past 14 years. He prefers games that last 25-40 minutes and don't involve Grip of Chaos. In his non-magic life he studies meteorites to descry the history of our solar system.